After a long run-up, including a successful Kickstarter fundraising effort, Tom Micklethwait is open for business on Austin’s East Side. 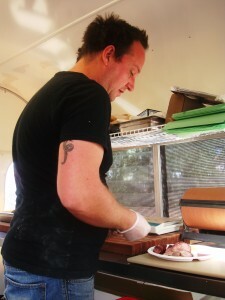 Micklethwait is the owner and the pit boss of this brand new food trailer. I expect big things from this man as his early work already shows a seasoned hand on the big smoker that he and a friend welded from scratch. This entry was posted in Texas Barbecue Photos and tagged Austin, barbecue, east austin, Micklethwait Craft Meats, texas. Bookmark the permalink.